After a warm and sunny practice on Saturday for many, race day on Sunday brought colder temperatures and a little wind. 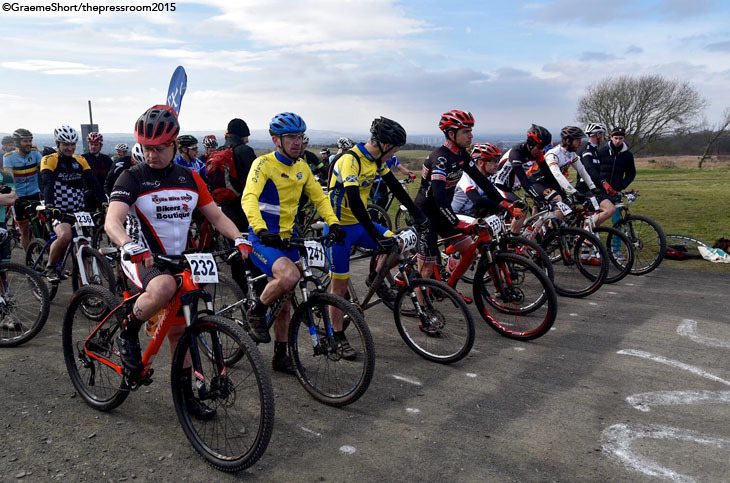 It was great to see large numbers of riders in every category and the atmosphere was festive and very friendly. 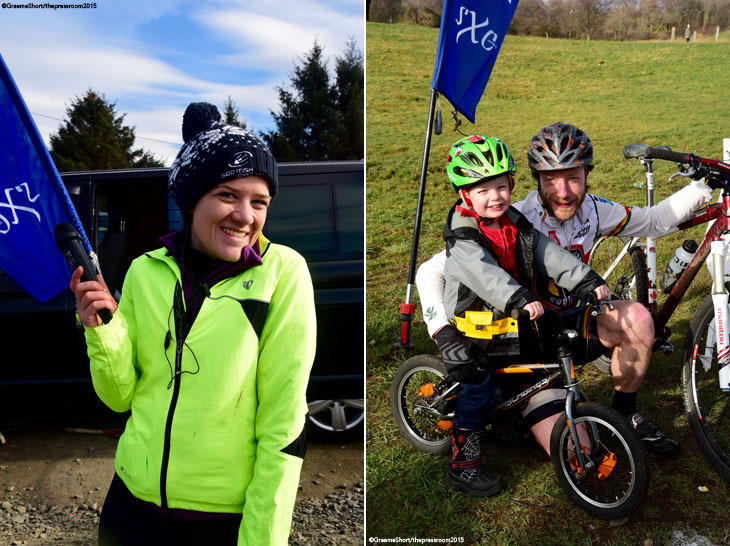 SXC organisation was brilliant and everything ran very smoothly, testament to the level of commitment that the organisers bring to these events. Morven Brown in particular was superb, with her very colourful, enthusiastic and professional commentary, keeping the spectators and riders well informed. It was inspiring for us all to be riding on the course of the Commonwealth Games 2014 — a course known for being physically and technically demanding. For those like me (Peggy) who were new to XC, the course was made accessible thanks to the 'line B options', but was still challenging. 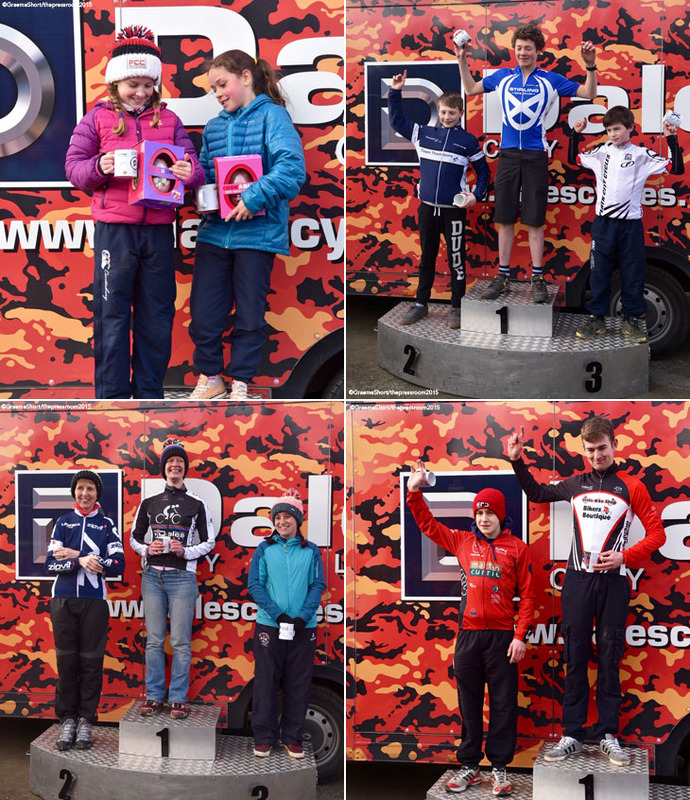 A large field of Juveniles Males produced some very exciting racing, with Charlie Aldridge taking victory by just under a minute from Jamie Johnston, with Rory McGuire coming home 2 minutes behind making the final place on the podium. In the Juveniles Females, leading the race out from the start was Anna McGorum who looked very strong along with Polly Henderson. Anna unfortunately succumbed to a broken chain which ended her race prematurely. Polly Henderson was then left alone to take a comfortable victory over Anna Flynn with Anna Shackley producing a strong race to finish in third. The Youth Male category produced some exceptionally quick lap times with Conner Johnstone taking the victory by 36 seconds and in the process posting the fastest lap time of the morning race. 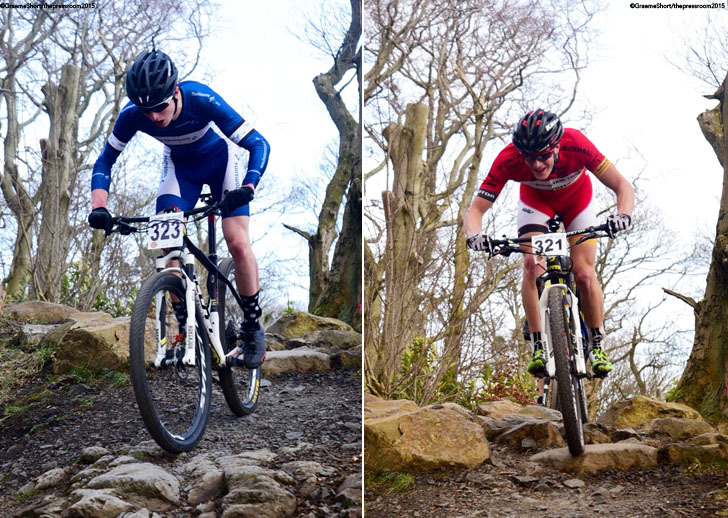 Sean Flynn was very close second and Olli Dawson came in third. Emily Field dominated the Youth Female race in spite of suffering a mechanical in the first lap. Megan Wilkinson was lying in 2nd place for much of the race only to be caught on the last lap by Louisa Watt. 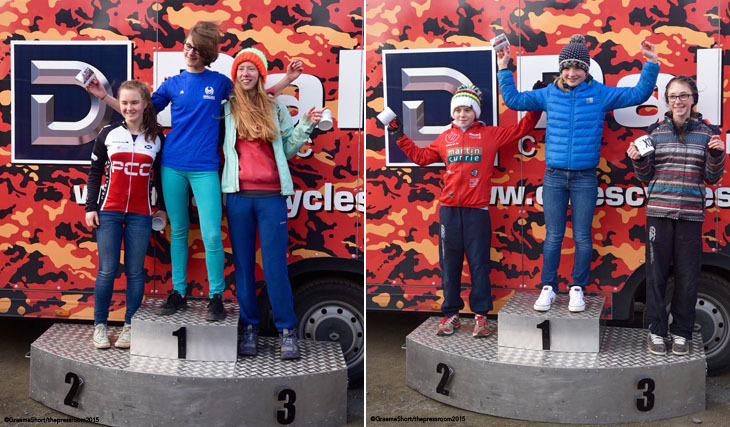 The Junior Female race was a very close battle between Erika Allen and Ella Conolly for the top spot, with Erika producing a sprint up the last hill into the arena, winning by 5 seconds, with Zoe Nix taking the final place. In the Senior Women, Elizabeth Adams rode to a convincing win, over Elizabeth Clayton 4 minutes back and Katherine Booth 6 minutes back. The Elite Women was an exciting race due the quality of the field. This was familiar territory for Kerry MacPhee having competed on this course in the Commonwealth Games. She showed her class and produced a solo ride for a comfortable victory. 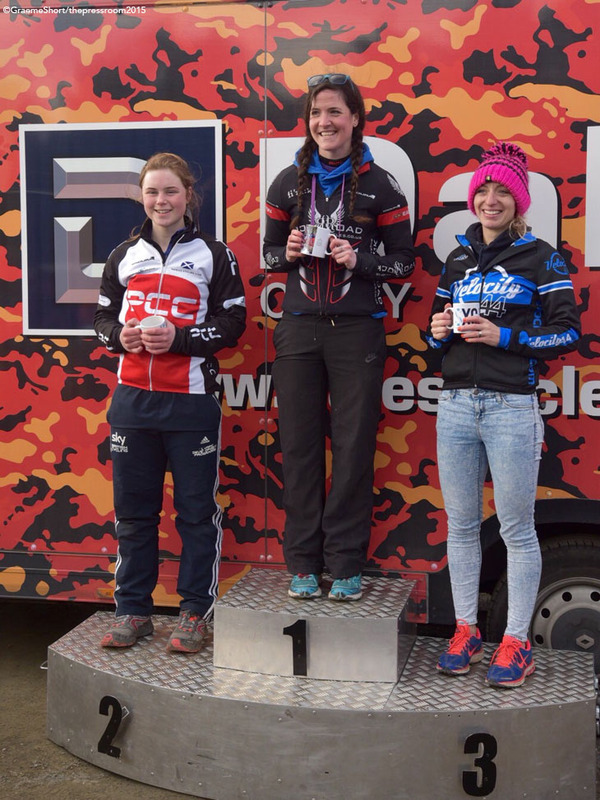 After a strong start, Lucy Grant settled into second place with Jane Barr coming 3rd. It was fantastic to see such a big field for the GrandVet (50+), including Scottish and British champions. challenge from Mark Barnett taking a close second place. Gregor Grant, former British champion, showed he still has what it takes to step onto a podium in 3rd place. In the SuperVets (60+), John Shirley, former British champ at Cathkin Braes, comfortably took the victory from John Newton by just over 5 minutes, with Eddie Gronkowski taking 3rd. 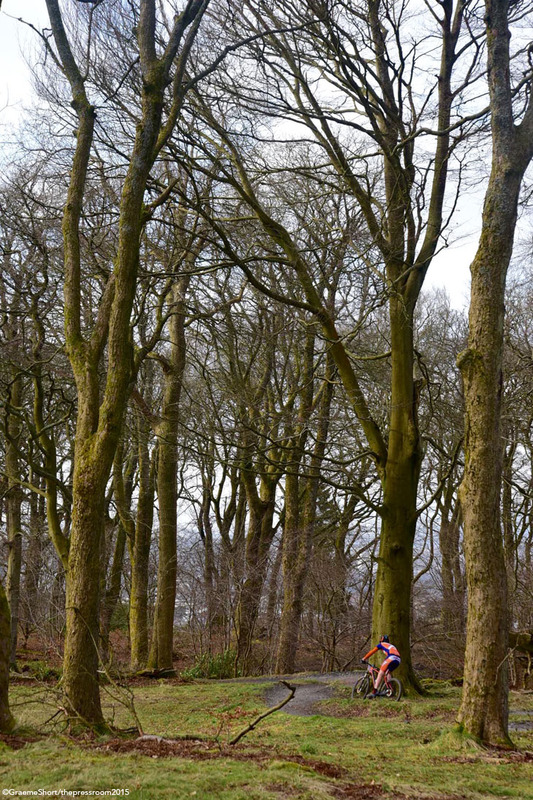 race Scotland's top riders on this excellent commonwealth games course ahead of the upcoming National XC race this summer. A blistering start saw Stuart Wilcox, returning to XC after a lengthy absence, emerge from a cloud of dust to lead out the SXC stalwart Rob Friel. These two quickly opened a gap on a large chasing field. However, Wilcox faded towards the end of the first lap, moving back through the field. This allowed Friel to move clear to chase down the top juniors, by his own admission pushing himself deep into the red in the process. After heading into the second lap, he came off the gas slightly, pacing himself through to a controlled victory. English visitor James Edmond came through into a clear second, 2.55 down on Friel with Dougie Shearer taking a fine third spot after a mid race scrap with Shawn Clark. Scotland has a reputation for producing some outstanding young XC athletes, capable of mixing it up not only with the best in the UK but also on an international stage. Hot off a superb second place in a UCI cat MTB race in Banyoles, Spain Scottish cycling programme athlete Harry Johnston was the man to beat. However, the presence of two other outstanding young riders in the form of Mark McGuire and Calumn McGowan along with top English juniors was sure to produce some of the most exciting racing of the day. This was confirmed in the early laps, with Johnston and McGuire appearing first into the arena, together setting the two fastest laps of the day, very closely followed by McGowan. Unfortunately, lap two saw the usually very strong McGuire forced to retire with cramp, allowing Harry Johnston to push on to produce the most controlled and dominating display of the day, winning by a full 7 min. Behind, McGowan was having to tough it out with Miles Worer who managed to break free to take a fine second, with McGowan hanging on to finish the podium. The Vet Male race always provides a spectacle and this was no different. Coming into the first race of the season is always a bit of an unknown. However, if one thing is predictable, it is that Gary Mccrae will be on top form from the gun. This was found to be the case again. Gary took a fine victory, proving that he will be hard to get past this year. However, and in spite of a winter of very little training, Greg Walker showed he has the class to challenge Mccrae later in the season, after coming through the field in the latter stages to finish just 41 sec down on Mccrae. John Mccaffery took the final spot, in a very close battle with Paul Cooper. It was great to see a large entry for the Sport Male cat this year. The top riders in this category showed they have the lap times to step it up to the next level, which bodes very well for the future of the SXC elite male cat. Garry Cunningham rode clear to a fine victory by 2.49 from Micheal Sproul who came through to take second with very consistent lap times ahead of John Mitchell. 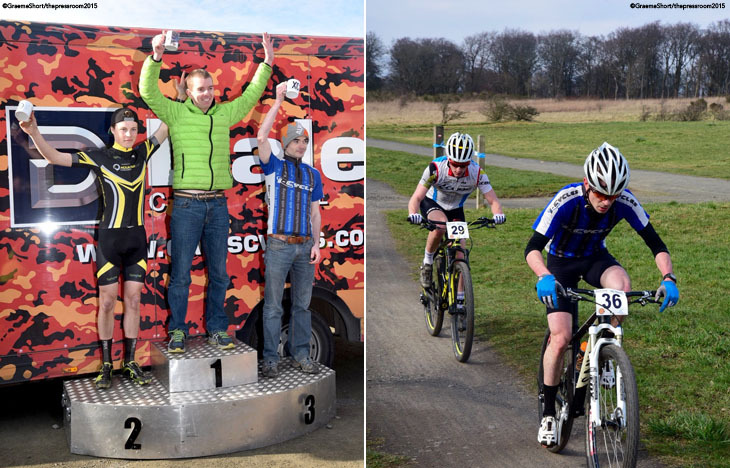 That's Round 1 done and dusted and it's onto Dalbeattie on 26th April…the contenders will be training furiously through the Easter break in order to keep or improve their high finishes. Join us here at The Press Room for all the action.